There are often good reasons for placing money in shadowy accounts abroad. - Det vore bra om vi så snabbt som möjligt kan komma ner till långsiktigt vettiga priser vilket är en halvering av den nivå vi ser nu, säger Hans Lind. It's so silly that I almost suspect Christiano et al. of staging a false-flag operation to get more people to hate DSGE modelers. Fyra svenska börsbolag står för nästan hälften - 46 procent - av storbolagens samlade utdelningar. Börsbolagen är händelsevis Handelsbanken, Nordea, SEB och Swedbank. En svensk medelklassfamilj som bor i hus eller bostadsrätt kan nu ta stora lån och betala pyttelite i ränta för att renovera, köpa bilar eller fritidshus. Det är inte längre för att Sverige säljer bilar, malm och skog som tillväxten ökar. Det är för att våra banker går så bra. maturing into a structural expansion of economic activity, profits, and employment that probably has many more years to run. Janet Yellen expressed early worries about house prices. While she did not expect the financial collapse — few did — she understood it better than many as it was under way, to the point of giving a lecture on “A Minsky Meltdown: Lessons for Central Bankers” in April 2009. I turn, finally, to perhaps the biggest question about the crisis. Could they have avoided the failure of Lehman in September 2008? Harry Flam ser inte heller att vi står inför en bostadskrasch. – Jag tror inte det kommer att bli något större ras, säger han. Christina Gustavsson, forskare vid institutionen för fastigheter och byggande på KTH, är lite mer försiktig inför framtiden, och menar att frågan om en eventuell bostadskrasch är svår att svara på. Germany’s council of ‘Five Wise Men’ issued a stern rebuke to the ECB earlier this month over its loose money habits. Professor Richard Werner, a German economist from Southampton University, said zero rates are fatal for Germany. This month, the European Commission's president called for an acceleration of the eurozone's eastward expansion. But his plan for doing so could recreate the conditions that fueled the EU-wide crisis stemming from Southern Europe just a few years ago. Among their other shortcomings, banks had done too little, too late, to recognise losses on wobbly assets. Under existing standards they make provisions only when losses are incurred, even if they see trouble coming. IFRS 9, which comes into force on January 1st, obliges them to provide for expected losses instead. they applied trickle-down monetary policy in the hope that by giving a boost to asset prices they would create wealth that would trickle down to the bottom 50% of the US population or to Main Street. Under these circumstances, there is a strong case for loosening fiscal policy and borrowing more. This is especially true for policies that put money directly into the hands of people who will spend it quickly and counteract sluggish demand, and for investments that have long-term benefits. Coordinators: Olivier Blanchard and Lawrence H. Summers. “The blunt truth is there is a single monetary policy, but there is not a monetary union,” Mr Tucker said. There is the money that Mario [Draghi, ECB president] issues, the notes. But these are inconvenient to carry about. Most of the money we use are deposits held in 19 national banking systems. Som premiärminister ledde han G20-mötet som kan ha räddat världen undan en depression under finanskrisen. Dessförinnan hade han som finansminister stoppat Tony Blairs försök att föra in Storbritannien i euron. Som Grekland visar är det svårt att lämna euron. Utan Brown inget Brexit. Utan Brexit inget självständigt Storbritannien. Marschen mot ett Europas Förenta Stater hade varit mycket svår att stoppa. Hans efterträdare David Cameron utlyste en folkomröstning om självständighet för Skottland, en omröstning han höll på att förlora. Gordon Brown, från Skottland, var viktig för att detta med nöd och näppe förhindrades. But the ECB was deliberately constructed to be different from normal central banks. One of the most striking moments in the euro crisis saga was when European elites forced Silvio Berlusconi to leave office in favour of unelected Mario Monti. This was possible because Italy is a member of the euro area, and is therefore uniquely vulnerable to capital flight and bank runs. Spaniards have good reason to hold euros in bank deposits and euro-denominated bonds as their safe asset, but have literally no reason to hold Spanish bank deposits or Spanish government bonds. At any moment, euro-area creditors could decide they no longer wish to finance a country’s banks and its government. This arrangement is inherently unstable. Local banks and non-financial companies ended up borrowing dollars and yen short-term to fund real estate bubbles and acquisitions. The institutional changes recommended by euro-area elites will likely exacerbate global imbalances. One of the interesting ideas we discussed was the “re-nationalisation of fiscal policy”. In exchange for accepting German plans for a European Monetary Fund, which would only provide emergency lending after private creditors are forced to take large losses, elected governments would have more freedom to tax and spend. Treaty-based deficit rules would be replaced by market discipline. The Fangs have delivered spectacularly in the past couple of years. 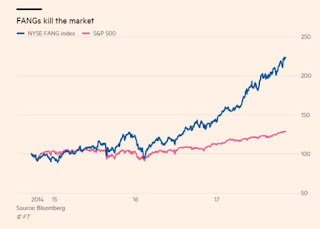 Apple could also hasten the drive to $1 trillion by buying back shares as it has actively done in the past, as it continues to issue bonds to fund buybacks and dividends. 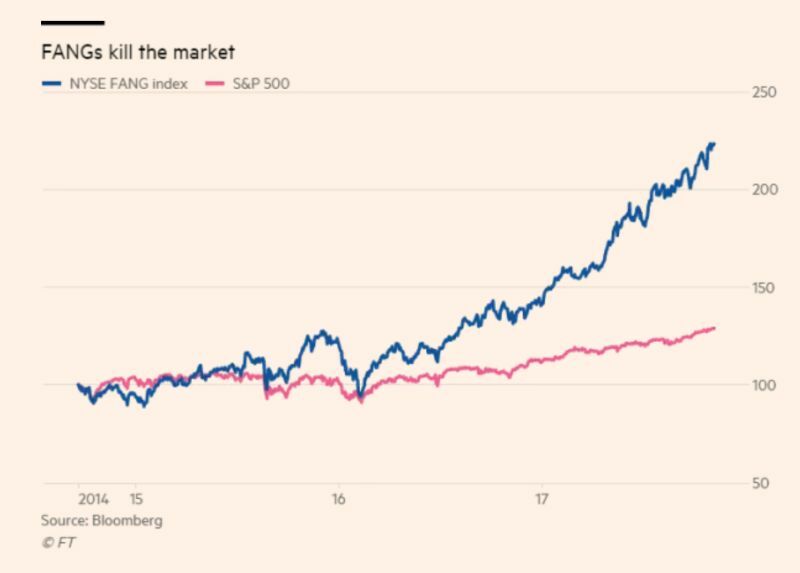 The good news is that the Fangs are not overvalued relative to the market. The bad news is that the entire market is overvalued. Research from the Boston-based fund manager GMO. who bears the scars of his country’s bruising scrap with the EU over its debt crisis. David Davis is currently reading his account of those talks, Adults in the Room, a searing indictment of the anti-democratic, underhand and downright mendacious tactics used by what Varoufakis calls the EU’s “deep establishment” to make the Greeks grovel. Att avveckla ränteavdragen och återinföra en rimlig fastighetsskatt vore på sin plats. The cult of inflation targeting began in New Zealand in the late Eighties. Let us at least hope that the great monetary misadventure has burned itself out. In the wrong circumstances such a doctrine is a formula for asset bubbles and deranged financial cycles, and that is precisely what events have conspired to produce. The logic of constructing an entire financial order around one arbitrary variable such as inflation was never compelling. This technocrat urge to fine-tune prices is a radical departure from their historic role of central banks: to ensure financial stability and act as a lender-of-last resort in a crisis. Gordon Brown has described his failure to rally the nation round the “necessary fiscal stimulus” following the financial crisis as one of the biggest regrets of his time in office. Den svalnande bostadsmarknaden är inte ett tecken på att det finns en bostadsbubbla som håller på att spricka. Harry Flam tror snarare på en mindre dramatisk situation där priserna långsamt sjunker eller bara planar ut.